This Adelaide Hiebel pastel on canvas was done in 1935, to be used as calendars for the Gerlach Barklow Calendar Company. It can also be seen as a jigsaw puzzle, and as a cover for a German magazine called "Die Hausfrau" (which means "The Housewife"). This painting is 30 x 40 inches, as are many of her pastels. This image has been seen titled, "Fire-Fly" and "Wah-Wah-Taysee". 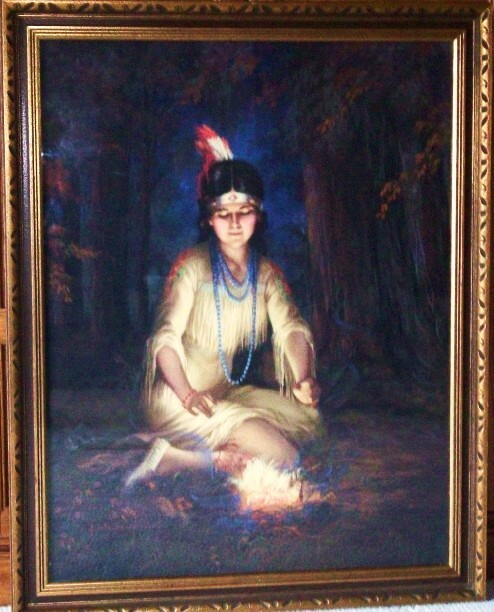 Hiebel did several Indian maidens during her career, and even purchased one for herself titled, "In the Heart of the Lily".